A few weeks ago, my wife and I were at a street market near our home. There were lots of small business vendors selling their wares. There was a good variety; homemade soaps & lotions, boutique-style cupcakes, even a spice vendor. Of course because I market my services specifically to small businesses and startups, I always like to chat with the vendors at these little markets. I’m regularly shocked at how often these small startups have neglected the concept of branding. I come across lots of small startups with great products. Naturally, when I find a business with a product I absolutely love, I want to use them again. Unfortunately, I regularly stumble onto small, one-person businesses that don’t have a website, email, or even a business card! A few weeks ago at an early Fall farmers market, my wife and I found this awesome cookie vendor. He had a great product. He had a great personality. After buying some of his cookies, we chatted with him for a few minutes and I asked him for a business card so we could order more. He responded, “Oh I haven’t gotten those yet, this is still my first year in business.” No email. Not even a phone number. I can’t even tell you his company name anymore. It’s a perfect example of why branding your business from the start is critical. My wife and I would be buying his product regularly, but now we don’t even know who he is. What Exactly IS Business Branding? At it’s simplest, branding is a way of identifying your business. Branding means that you put your business name, product, or imagery into the minds of your current and potential customers. It’s how they recognize and experience your business. As a result of good branding, your company becomes synonymous with the products and services you provide. Branding can be accomplished through both material and non-material methods. Material branding includes all the physical things you give to your customers or display in your stores. Flyers, business cards, & product wrappers are all on the list. One of the first and most important branding materials that you should have is your business logo. Your logo comes first because it’s going to be showing up on all of your other marketing materials. In fact everything else we’ll talk about moving forward in this article will probably end up having your logo on it. Your logo is so important, you should really consider having one professionally made. I spent the first few years using a logo I had made myself and only recently had one done by a true professional. The difference is staggering and I wish I would have just done it from the start. There are lots of freelance graphic designers out there. I prefer freelancers because I like to support entrepreneurs and generally they provide the same quality as a design company without the overhead cost. If you’re determined to design a logo by yourself, then try an online logo maker. Sure they might seem old school, but business cards are still a cornerstone of company branding. I made the mistake once of designing my own business cards – what a tragedy. I was stuck with 5000 business cards that looked awful. Don’t make the mistake I did. If you can’t have your business cards professionally designed, at least use a clean template design and a high quality printing provider. If you don’t want to pay for a business card design, at least go online and get some clean templates. Don’t try to put your entire business on a card. Only list a few of your primary services. I like to get my business cards from ClubFlyers. They have great prices and a nice online design tool that lets you pick from dozens of great templates. 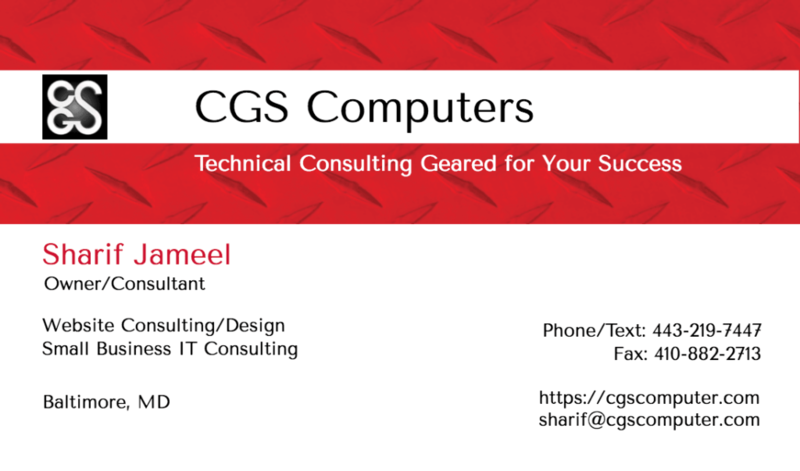 CGS Computers business card (back) with logo & tagline/slogan and only primary services offered by us. Don’t try to put your entire service portfolio on a business card. This is another great place to brand your business and a perfect spot for your business logo. Having your logo put on containers & bags might cost a little extra, but it’s a brand advertisement that will pay dividends. Don’t overlook the branding opportunity that comes with employee uniforms. Put company logos and slogans on your work shirts, hats, aprons, or any other part of your business uniform. You’ll get professionalism points and your employees will be walking advertisement! A company website could potentially fall under both material and non-material branding. Put your website address on your business cards, product containers, and uniforms. You don’t have to spend a lot of money these days for a website. If you don’t have a website however, consider having one professionally made and maintained. Do you have a special way of providing a service? Even the way you deliver your product could be a potential for branding. Consistency is the key. Customers who receive the same signature service over and over will come to expect it, and recommend it to others. 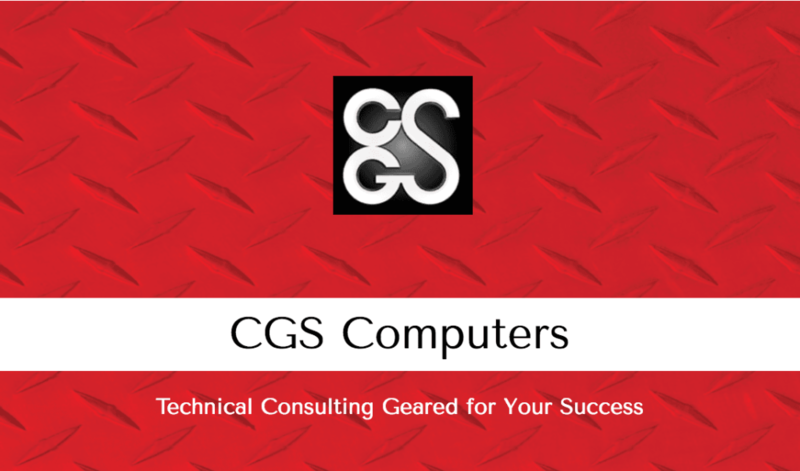 Technical consulting geared for your success. That’s our tagline. It’s on our business cards, our website, and all of our sales flyers. We do this because it’s another way to brand our business. Your tagline must convey why you do what you do, and why customers should choose you instead of other providers. Our tagline states clearly that we’re legitimately vested in the success of our clients because it means continued business for us. Our vehicle for success, is the success of our clients. Branding your business won’t guarantee your success. It’s not a silver bullet. Most of all, you must understand that branding well won’t make you a great business, but just all great businesses do brand well.